Bibingkang Malagkit made of glutinous rice, coconut milk, and brown sugar perfectly sweet, creamy and chewy. Topped with sweetened coconut spread, this Filipino rice cake is a delicious treat you’ll love as snack or dessert. Guys, I am sorry I haven’t been here as often this month and that my recipe posts have dwindled to once a week. You see, I am insane because, for some reason, I think I have super powers and can do it all. Also, in my defense, I haven’t totally neglected the blog. I’ve been knee-deep in reshooting and updating old recipes to include in-process photos and helpful tips. I hope you’ve already checked out our revamped biko post because this bibingkang malagkit also belongs to the same family of Filipino kakanin. In fact, this native delicacy is also referred to as biko in other regions of the country. 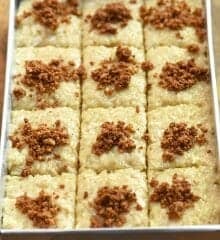 The ingredients of both rice cakes are mostly the same, but while the other is topped with latik, this version is topped with coconut caramel topping and finished off in the oven to brown. While you can partially cook the glutinous rice in water and finish off in coconut milk and brown sugar, I like to cook the rice straight in the sweetened milk mixture. It can be a little tricky finding that sweet spot of perfectly cooked sweet rice and a chewy texture using this method but the extra depth of flavor is worth the effort. As different brands of rice work differently, and the required liquid may vary, I like to start off with 4 cups of coconut milk and then add water in small increments as needed to thoroughly cook the rice. Do not skip the salt as it helps balance the sweetness and richness of the rice cake. For an extra boost of aroma and flavor, add a knotted strip of pandan leaves when cooking the rice. You can also line the baking dish with wilted banana leaves. Please do not leave the rice mixture unattended as it can burn in the bottom pretty quickly. Use a wide non-stick pan to make stirring easier. The sweet rice mixture is ready when it begins to pull away from the sides of the pan. Since we are not making latik here, use melted butter to grease the baking pan. If you have coconut oil on hand, so much the better! The caramel sauce is pretty easy to make but does take time to thicken. Make it in another pan the same time as the rice mixture so they’ll finish congruently. Or you can prepare it a day before and store in the refrigerator in a covered container. I used coconut milk in this recipe so you’ll need a fewer number of ingredients but swapping coconut cream (kakang gata or first extraction) will speed up the process as it’s more concentrated and has less water content to reduce. Use a non-stick pan so you don’t have to stir the mixture as often and use a wide shallow pan instead of a deep saucepot so the excess liquid will evaporate quicker. The coconut caramel is ready when it’s thick enough to coat the back of the spoon. Spoon the caramel topping on the rice cake and spread evenly to cover the cake completely. Tap the baking pan on the kitchen counter a few times to smooth out the thick sauce and to remove bubbles if any. The pan I use is 5 x 8-inch in size; if using a wider pan or you prefer a thicker caramel, you might need to double the amount. Give this bibingkang malagkit a try and let me know what you think. I’ll be back in a few days with my almost-famous cassava cake updated with new photos. Enjoy! Bibingkang Malagkit made of glutinous rice, coconut milk, and brown sugar perfectly sweet, creamy and chewy. Topped with sweetened coconut spread, this Filipino rice cake is a delicious treat you'll love as snack or dessert. Brush bottom and sides of a 5 x 8 baking dish with coconut oil or melted butter. Set aside. In a wide, non-stick pan over medium heat, combine 4 cups of the coconut milk, 1 cup of the brown sugar, and salt. Bring to a simmer, stirring until sugar is dissolved. If using, tie a pandan leaf into a knot and add to coconut milk-sugar mixture. Add rice and cook, stirring occasionally, for about 20 to 25 minutes or most of the liquid is absorbed. Remove pandan leaf and discard. Add water in 1/4 cup increments and continue to cook, stirring regularly, for about 25 to 30 minutes or until rice is fully cooked and the mixture is very thick and sticky. Meanwhile, In a non-stick pan over medium heat, combine the remaining 1 cup coconut milk and 3/4 cup brown sugar. Cook, stirring occasionally, until very thick yet spreadable. Transfer cooked rice into the prepared baking dish and flatten evenly. Spoon coconut caramel topping over rice and spread across the surface to completely cover. Bake in a 350 F oven for about 15 to 25 minutes or until topping is firm. Increase temp to 375 F and continue to bake for another 15 to 20 minutes or until topping is golden. Kindly convert this recipe to an Instant Pot recipe as I use IP all the time for rice cooking. 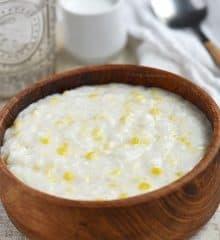 Does this recipe’s topping get watery/rumny after a few hours or does it stay soft-solid on top? This is my problem mo matter how long i cook the topping to thicken it first before baking. I’m happy to note that you are making a blog for IP and slow cooker recipes! What’s the name of that blog? Is the pandan leaves necessary? Hi, Lalaine! It’s me again. I’m wondering what’s the best way to store this after cooking? How long does it last at room temp? Can I put leftover in the fridge? If so, how do I reheat it? Microwave or it can be reheated in the oven? I don’t recommend keeping this at room temperature for more than a few hours as the coconut milk spoils pretty quickly especially in hot weather. You can store it in the fridge for up to 3 days. I usually reheat in the microwave for a minute or two but it’s fine to do in the oven as well. Just set at low heat and tent the cake with foil to keep from drying out. If this comment appears twice, I apologize! What size pan works best for this? I apologize for the late response. I usually use 9 x 13 baking pan, it really depends on how thick you want the rice cake to be. Yes, you can bake it later. Just make to keep in the fridge as it will spoil fast because of the coconut milk. What size and type baking dish do you use? Can it be made a day or two ahead of time? What size of baking dish do you use with this recipe. Will be trying this today. Will be trying the 9×9 since it’s only 2 cups of sweet rice. What is the difference between Bibingkang Malagkit and Biko? It looks like the two have similar ingredients and almost the same procedure. Please clarify the difference. Thanks! Oh! i love this food!..thanks for sharing…. I am familiar with product from your recipe on Bibikang Malagkit. I remember this as a child and would love whenever mother would make it. As an adult, I noticed others calling it “Biko.” I remember that as a different dessert. Can you tell me why people say this? I notice some recipes even say this as well. thank you and good luck and God bless..